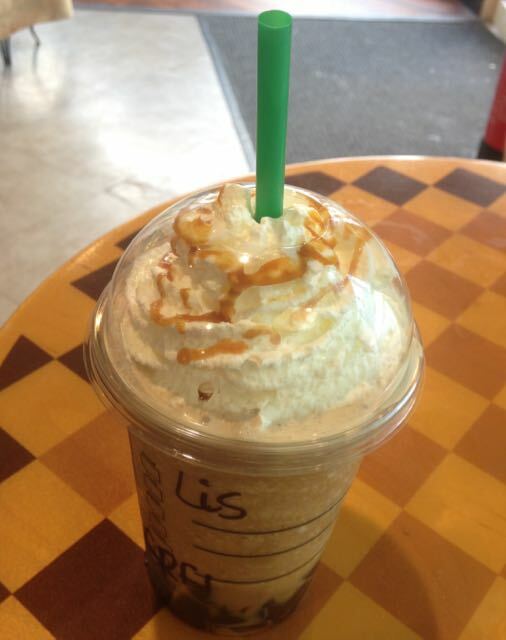 After a busy day’s shopping with my mum, we thought we would pop into Starbuck to refresh ourselves. It was hot outside and we wanted something nice to drink and cool down. I had a look at the menu board too check for any limited edition or new Frappuccinos and the sign behind the counter had something strange in it. Jelly. Only not a dessert an iced coffee drink with a layer of jelly cubes in the bottom. Ok, so obviously I had to order this. What happened next was a little odd for a number of reasons, number one the lady behind the Starbucks counter actually spelt my name right, which was a miracle on its own, and probably not that related to this review but it made me smile. Second was watching the two people behind the counter argue over how to make the drink. One said she thought the jelly should be blended, and that was how she'd made it earlier. The second person said that you leave the jelly whole in the bottom, “crazy” was the retort “how would you drink that”? the other lady pointed to the picture, showing that she was right the other looked bewildered but then left the jelly intact. I totally agreed that it would be difficult to drink and grabbed one of those plastic black spoons to assist. Okay so this drink consists of black coffee jelly cubes topped with ice blended caramel coffee Frappuccino, whipped cream (because it's been naughty) and caramel sauce. I went for the straw first and gave the drink a sip, and as if by magic the jelly cubes are soft enough to come up the straw. I felt I should tell the lady who made it, but I didn't actually go back to the counter. The jelly did give the drink a very lovely mix of textures, to those of you who have tried the current bubble tea craze you will know what I mean. A mixture of textures in your drink is weird, but somehow quite pleasing and fun. 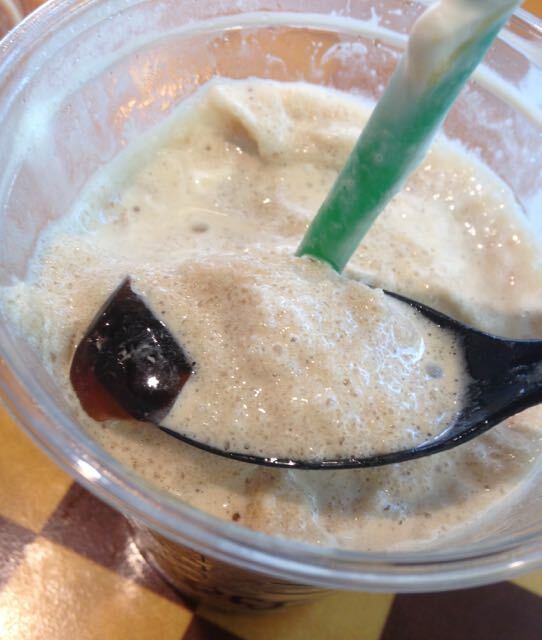 The coffee jelly pieces also seemed to make the Frappuccino more drinkable, in that it didn't seem as cold at the bottom, although it was a very hot day when I tried it. The jelly was a pure coffee flavour and the Frappuccino was sweet like caramel coffee so it meant that the balance of flavours for each sip was different too which was also really nice. Forget bubble tea, jelly is the thing for coffee, but who'd have thought it! Nice to see the bubble tea craze taking off! I've had these before in Japan (as well as bubble tea), the jelly is definitely not meant to be blended, as you discovered. I am so excited to try this in Starbucks! Lisa - Do let me know what you think of the UK version, and how it compares to the one you tried in Japan.